Delta employees have helped families across the globe for decades through its partnership with Habitat for Humanity, a global nonprofit organization that helps families build or improve a place they can call home. This week, Delta employees, along with customers and employees from partner airline China Eastern Airlines, are in Sancun, China, continuing this commitment to serve communities worldwide. 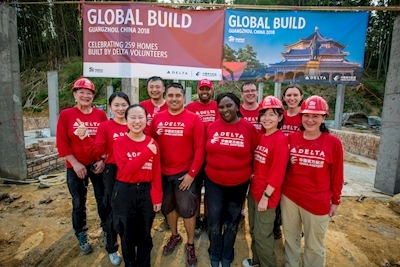 The 2018 Delta Global Build takes place from April 2 to April 6, marking Delta's 15th Global Build with Habitat for Humanity and the second Build in China since 2011. Volunteers include 52 Delta and its subsidiary's employees and retirees, representing 18 stations and seven countries, and 16 employees from China Eastern. Two SkyMiles customers and their guests, who bid for the opportunity to participate in the Delta SkyMiles Experiences online auction, also join the team as volunteers. The 72-member team will work alongside future Habitat homeowners in Sancun, a small village 85 miles north of Guangzhou, to begin construction of six new homes. The work involves the construction of foundations, bathrooms, kitchen facilities and the first two rooms of each home. "The Delta Global Build shows that travel is not just about connecting destinations, but also experiences, cultures, people, airlines and the global community," said Tad Hutcheson, Delta's Managing Director – Community Engagement. "It is a privilege to have our colleagues at China Eastern join us on this year's Global Build with Habitat for Humanity, strengthening our partnership and supporting the community we serve together in China." "We are grateful to Delta and the volunteers who are devoting their time to help families secure safe and affordable shelter," said Lynda Smith, Habitat's senior director of Corporate Relations. "To donate a week of their time is a generous act that will help transform the lives of homeowners and inspire them to continue to support our mission." 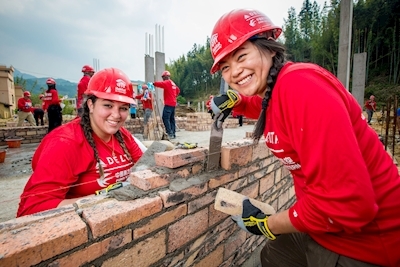 Delta volunteers have built or rehabilitated 253 homes in 12 countries all over the world since our partnership with Habitat for Humanity began in 1995. Delta Global Builds have been organized in South Africa (2006), Ghana (2007), India (2007), Chile (2008 & 2010), Thailand (2009), China (2011 & 2018), the Dominican Republic (2012), the Philippines (2014), Argentina (2015) and Mexico (2013, 2016 & 2017 Spring and Fall). China Eastern is Delta's strategic partner in China. Delta invested $450 million and acquired a 3.55 percent stake in China Eastern in 2015, and is expanding the codeshare agreement to increase access into interior China with 1,800+ round-trip flights per week to 50+ unique domestic mainland Chinese cities. Giving back to the communities where we live, work and serve is core to Delta's culture, and Delta Global Build is a fantastic way for Delta employees to give back by helping to provide safe, affordable and decent housing to those in need through our partnership with Habitat.